Review: Oh man—I don’t know if I’ve ever been more daunted by the prospect of writing a review. I mean, this is Harry Potter. Thanks to my fantastic failure at rereading the series since I started blogging, I’ve never reviewed any of the HP books until now. I wasn’t even going to write a review of Cursed Child, especially since I hadn’t reviewed any of the novels. 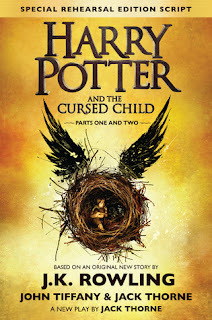 I thought I might write something about Cursed Child for the blog for next year’s Harry Potter Month event, but now that I’ve finished reading it, I’m finding that I need to talk through my feelings a bit. Now. And in the form of a review. Before proceeding, I’d like to beg pardon in advance for my vagueness throughout this review because just about every plot element is a HUGE spoiler. Please also excuse all of the italics; I’m feeling some strong emotions about this one. Going into both reading and reviewing Cursed Child with anything remotely resembling objectivity was impossible. Again, it’s Harry Potter. I did try not to get hung up on the format and kept in mind that I was reading a script of a play meant to be performed on the stage. It was a bit of an adjustment reading about our beloved trio again because seven novels preceded Cursed Child, but it wasn’t a distraction. Perhaps due to the play format, Cursed Child drops bombshell revelation after bombshell revelation. I can’t emphasize bombshell enough. There are so many plot twists packed into this, maybe because it has to deliver a conflict and its resolution by the end of the fourth act and not a seventh novel, but it’s still a lot to digest. I found some of the surprises plausible within the existing framework of the Potterverse but others . . . maybe not so much? One in particular definitely needed the details filled in but alas, they were not, leaving a rather large continuity gap. As much as I hate saying this, I also felt that consistency was kind of an issue for the characters. Ron gets shortchanged the most, I think; his primary role in Cursed Child seems to be the comic relief. As for Harry, there was a line of his that makes me wince every time I think back on it. I get that living a normal life probably continued to be tough after he defeated Voldemort because there was no escaping being Harry Potter, one of the most famous wizards ever. I cannot, however, ever picture Harry uttering these words, even at his angriest. They certainly amplify the dramatic tension in this scene, but in my opinion at the expense of Harry acting in a very uncharacteristic manner. I know that so far, this review sounds like I didn’t enjoy the play, but that’s not the case. Yes, I did have the above-mentioned issues, but virtually nothing was going to cloud the fact that I was reading about the wizarding world again, eleven years after Harry Potter and the Deathly Hallows. I admit that an unstoppable wave of sentimentality was always going to be the deciding factor in my overall rating of Cursed Child, and that remains true. The play does, however, feature some merits that are all its own, including the wonderful Scorpius Malfoy, son of yes—Draco. Young Scorpius has already gained quite the fanbase, and you’ll quickly discover why. I really liked how the play traversed the entire original series, an ambitious and—here I go drowning in sentiment again—wonderful nostalgia trip. I also loved how the play’s title was open to several interpretations of which character it referred to. Family is at the forefront of the plot, and it’s explored in great emotional depth that will often seize your heart in its grip. While I don’t feel that Harry Potter and the Cursed Child is on quite the same level as the original books, I give J.K. Rowling credit for venturing outside of the novel format. I would absolutely see the play; it would be extremely interesting to compare the experience of just reading the script to watching it performed live by actors. All in All: Fan reactions to this have been all over the place, and me, I fall somewhere in the middle-ish. I would have bought and read this even if it had received a million negative reviews. For me, Harry Potter will always be among the books that truly changed my life, and I’ll always follow it wherever it journeys. I love it unconditionally, and nothing can ever change that. At the same time, though, I agree with a few of the criticisms that have been made about Cursed Child. So many of us love Harry Potter and his friends so freaking much, it’s hard to say who’s going to adore the play merely because it’s a new HP story and who’s going to be upset by the frenzy of revelations and some of the character portrayals. Reading Cursed Child is most certainly an instance of Your Mileage May Vary. I'm always here for you, LOL! I'm EXTREMELY eager to hear your thoughts on this and can't wait to discuss it with you! But, I totally understand why you'd want to savor your reread of the original novels. I know I would, too, if I'd just finished a reread! I won't be reading this one until it come out in paperback. But reading this review makes me a bit hesitant. I don't know if I wish to preserve Harry and the crew from the ending of Deathly Hallows, or have all my warm fuzzies blown to hell from these bombshells in this play. But I also want to know what they're doing now! Such conflicting emotions. I'm glad to know that even though it was everything you'd hoped, that it was satisfactory and nostalgic. Great review, you've given me a lot to think over. Reading Cursed Child does present quite the dilemma! I know exactly what you mean about being torn between wanting to remember the series as it ended in Deathly Hallows and wanting to check in with the characters! 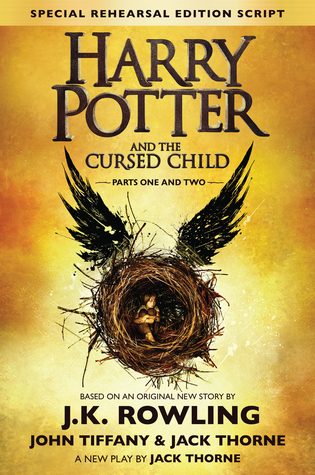 Cursed Child is definitely a highly personal reading experience; I'll be curious to know what you think of it when you do read it! What a fantastic review! I appreciate the vagueness, but you put enough here for me to really feel how the book was received by you. I'm worried I will have many of the same feelings about the bombshells and character tweeks and I haven't even started reading yet. I'm going to wait until AFTER Empire of Storms as that one tops my priority list right now. I love how you said though that ANYTHING Harry Potter related will be enjoyed for the most part because it's diving back into the Potterverse. I am especially looking forward to seeing Fantastic Beasts and Where to Find Them. Fantastic review!! Awww, thanks Jaclyn! Whew, this was such a hard review to write! I was paranoid about spoilers, lol. I've got my reading schedule cleared for Empire of Storms, too; I can't believe that it's almost here! And I'm excited about the Fantastic Beasts movie as well; it looks amazing!